Hi everyone. 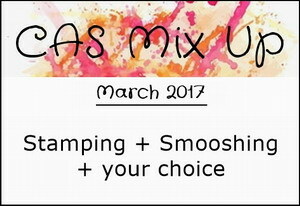 One last card for the CAS Mix Up March Challenge - Smooshing. 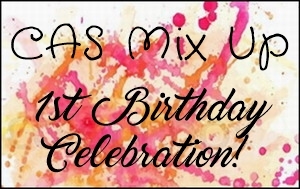 My CAS Mix Up card has Stamping, Acetate Smooshing and Watercolouring. We're celebrating our 1st Birthday this month with a few prizes. :) The challenge ends in a few days. I used acetate smooshing for the background behind my watercoloured and fussy-cut tulips. It adds so much fun and visual texture. 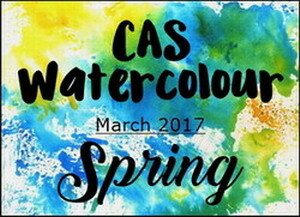 And since tulips remind me of Spring, I'm also adding this to the CAS Watercolour March Challenge - Spring. :) This challenge also closes in a few days. I hope you'll find time to play along. Such pretty tulips Loll with your smooshed background. I love that image so much and just love the smooshed background Loll. I love how your background looks more like splatters that an entire background. Beautiful tulips and a perfect background, my friend! Love it! The design and colors are quite striking. Loll, you have used one of my favorite stamps. I just love everything you do with this one. I love the way the smooshing is controlled in one area - I need to work on that!! And great job fussy cutting the image - it makes it really stand out against the green! Love your smooshed background for your pretty bouquet of tulips my friend. TFS and Think Spring!!! Hugs.. This is so pretty, Loll. I like how the smooshing frames your pretty tulip bouquet. Look at those pretty tulips! The smooshing looks great behind the bouquet. I like that it's not a ton of smooshing. Less is more sometimes. Beautiful card!! I really like the mint color for the smooshing. It sets off the tulips just right! Beautifully done! Love your results of smooshing too, limiting the color to behind your image! Gorgeous card! amazing, I just love tulips. Oh Loll what a gorgeous card - love your smooshed background, the green is so vibrant. Thank you for showing us this lovely bouquet of spring flowers! Good to see that smooshing doesn't always have to cover the whole panel - just a little behind an image looks great! Wonderful card, Loll. I love the pretty tulips. Beautiful tulips. And I love how from under them looked shyly these amazing splashing. You have such amazing ideas! Congrats to you and Bonnie on your 1st Birthday, Loll! You have both done an amazing job with your challenge(s)!!! 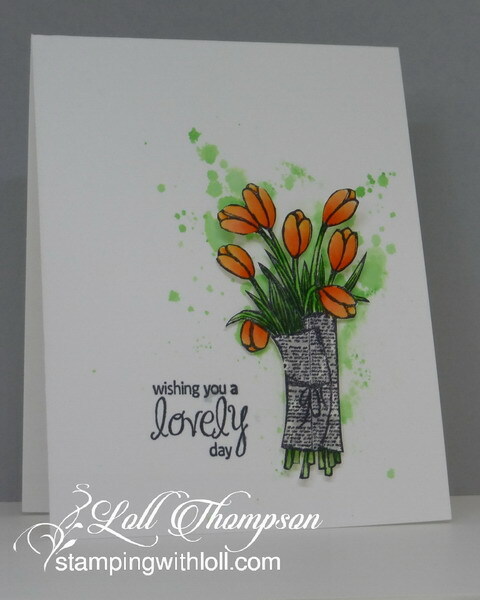 I love the effect of your smooshing technique on your background and your watercolored tulips are divine! I'm looking forward to playing along again as you begin your 2nd year of challenges!! !